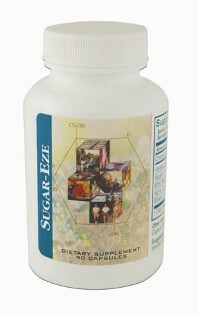 Sugar-Eze™ contains the nutrients necessary to aid the body in supporting proper glucose metabolism. There is one nutrient, a mineral, which stands out as the pivotal support for the person with blood sugar challenges. That mineral is chromium. Yet that mineral alone is far less effective than when it is properly combined with other nutrient co-factors included in Sugar Eze™. Additional nutrients found in Sugar Eze™ are aspartic acid, vanadium (as vanadyl sulfate), bitter melon, alpha lipoic acid and bilberry extract. These ingredients combined to make Sugar Eze™ have been extremely helpful for individuals with blood sugar challenges. Bitter Melon: This herb lowers fasting glucose levels and lowers postprandial glucose. Bitter Melon is also important in reducing oxidative stress in Type I and Type II diabetics and in protecting and renewing B-Cells in the pancreas. Alpha Lipoic Acid: Alpha Lipoic Acid is a powerful antioxidant that enhances insulin/glucose transport and increases insulin stimulated glucose dispersal. Our foods have been depleted of many of the nutrients we need each day. On top of that, according to research, the average American consumes roughly 150 pounds of sugar each year. Our bodies are not equipped to handle such a huge load of sugar, and without the necessary nutrients in your food, you don't have all the raw materials you need to break down these sugars. When you add to this the over-processing of our foods we have a real challenge. For example, the wheat used for all baked goods is digested by the body with the help of the mineral chromium. Unfortunately though, by processing wheat into flour, much of the chromium found in wheat is removed. Although mother nature intended for the wheat to be consumed with the chromium, so that it could easily be metabolized by the body, in our zeal to make white flour we refine the wheat to a point where we've altered it's composition and can no longer break it down properly. The result of this poor diet can contribute to obesity, hypoglycemia and diabetes. Certain nutrients have been shown to assist in glucose metabolism. These nutrients include aspartic acid, bilberry extract, chromium and vanadium. Four to six capsules per day with meals or as directed by your Health Care Practitioner.